Explore the best of both worlds at Ockenden Manor; with a modern spa attached to a quaint old hotel, complete with spectacular views of the South downs and a stupendous outdoor pool. Ockenden Manor is a fine Elizabethan manor house with 28 lavishly decorated rooms, an outstanding spa and a fine-dining restaurant set in eight acres of beautiful grounds overlooking Cuckfield Park. 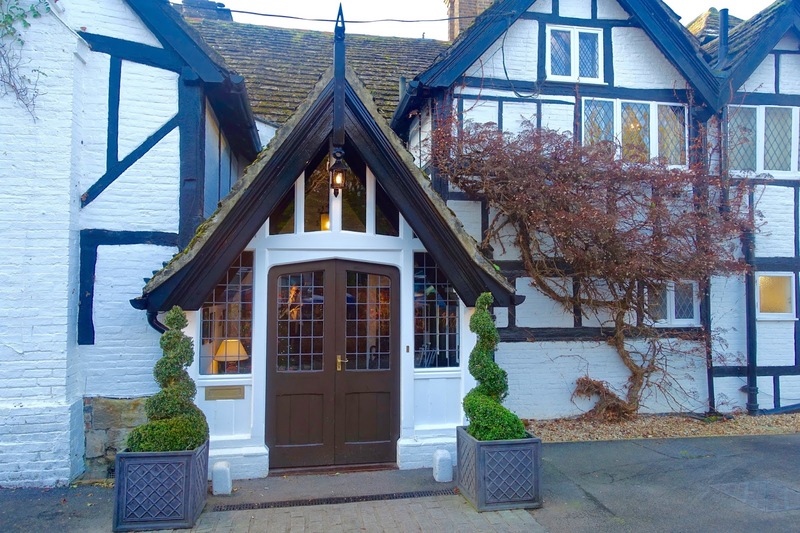 With its history and character, the elegant sitting room warmed by a roaring log fire and cosy, wood-panelled bar, Ockenden Manor is a wonderful place to escape to and it's less than an hour from London. Ockenden Manor and Spa is located in Cuckfield in West Sussex and is part of Historic Sussex Hotels; a collection of three privately owned hotels in Sussex. 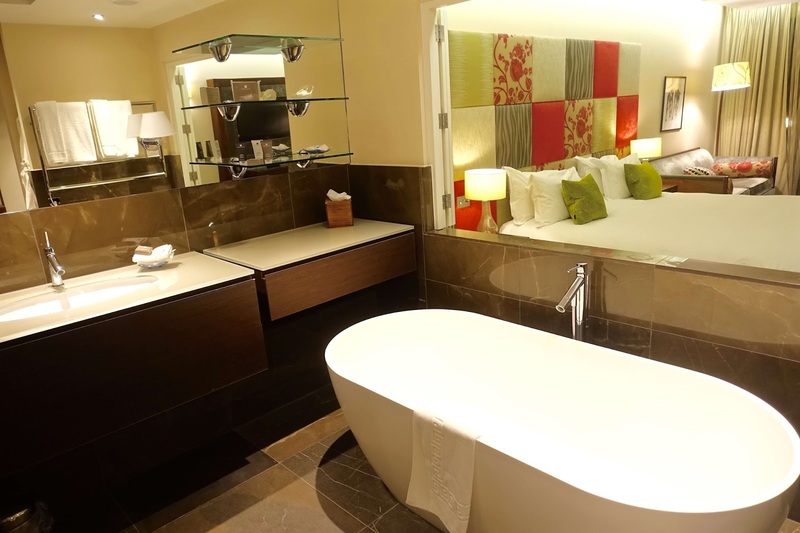 There is also The Spread Eagle Hotel and Spa in Midhurst and Baliffscourt Hotel and Spa in Climping, West Sussex. 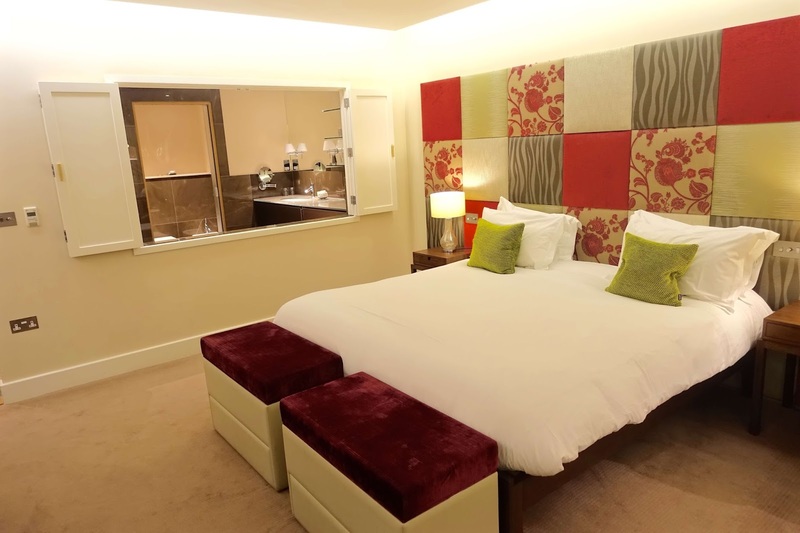 There is a range of accommodation on offer to suit all tastes; from fabulous over-sized contemporary spa suites with roof terraces (located in the spa building) to charming period suites and elegant, individually decorated rooms located within the main manor house. One thing I love about living in Sussex is that it is full of historic manors and Georgian houses which have now been converted into luxurious hotels with lavish gardens and grounds. The contemporary spa poses a startling contrast to the manor with its modern, glass-walled architecture and outdoor box-front structure. Inside you'll find an indoor and outdoor pool, outdoor hot tub, and indoor jacuzzi walk through rain showers, steam room, sauna, gym, relaxation area, airy sundeck and a guest lounge and cafe. 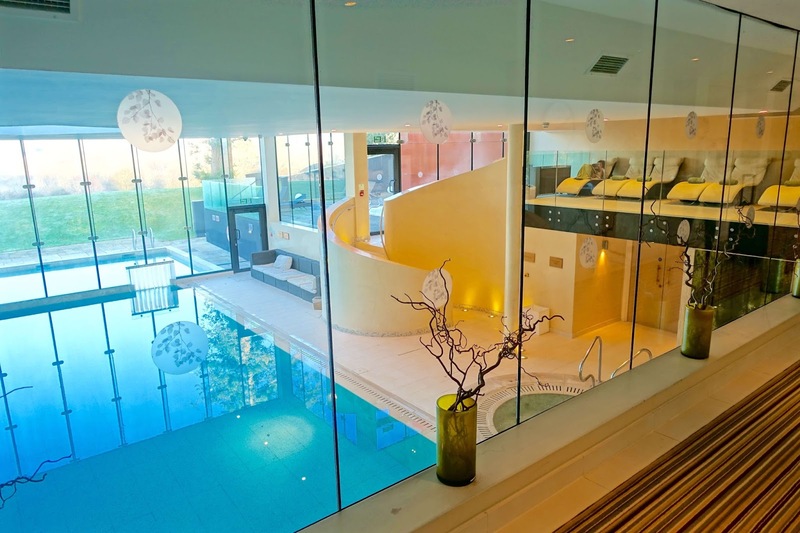 Ockenden Manor's spa is open till 9 pm mid-week and 10 pm on the weekend which is ideal for those who would like to take an evening dip in the outdoor heated pool or the steaming outdoor hot tub jacuzzi. The spa is set across a very open space, with lots of floor to ceiling glass windows spanning its entirety and adding to its luxury feel. The mezzanine level has an area with lots of relaxing loungers - with a direct view onto the pool, and outside there are further loungers scattered across a roof-top sitting area which provides views over the South downs. With lots on offer - there’s something for everyone. 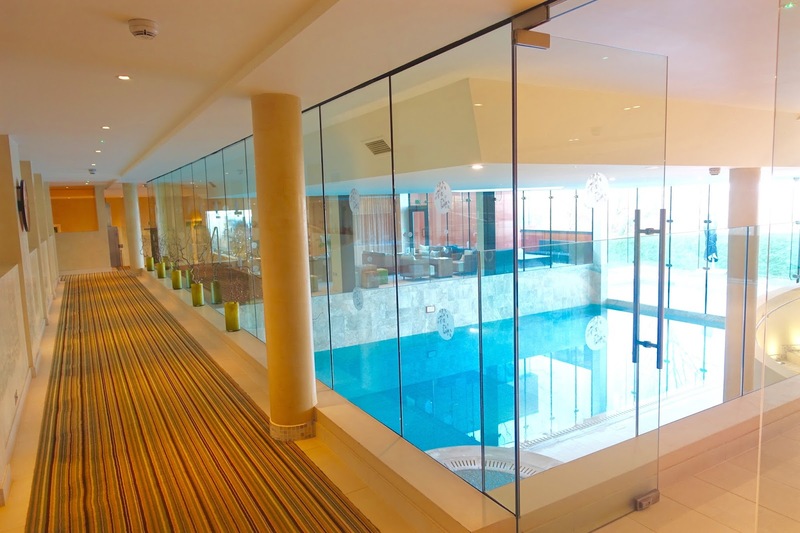 Whether you just fancy a relax in the sauna or steam room, the indoor pool leads out onto an outdoor heated pool. I decided to take a dip in here before dinner, the outdoor pool was the perfect temperature; while freezing outside but delightfully warm under the water's surface. It was nice to feel the crisp, fresh air on my cheeks. Little luxurious extras - a quirky ice dispenser to keep you hydrated, complimentary fluffy towels, robes, and slippers galore. Can’t afford the full works? If you’re looking for a girly evening, why not mix things up a bit and book yourself into the spa for an evening spa escape? I can’t imagine anything better than a glass of bubbles in hand whilst soaking up the outdoor jacuzzi. This would be an ideal thing to do on Sunday evening before heading back to work. As mentioned before, the spa itself is located in a separate building to the main manor house. The spa is still fairly new in structure and poses a stark contrast when compared to the older main manor house. 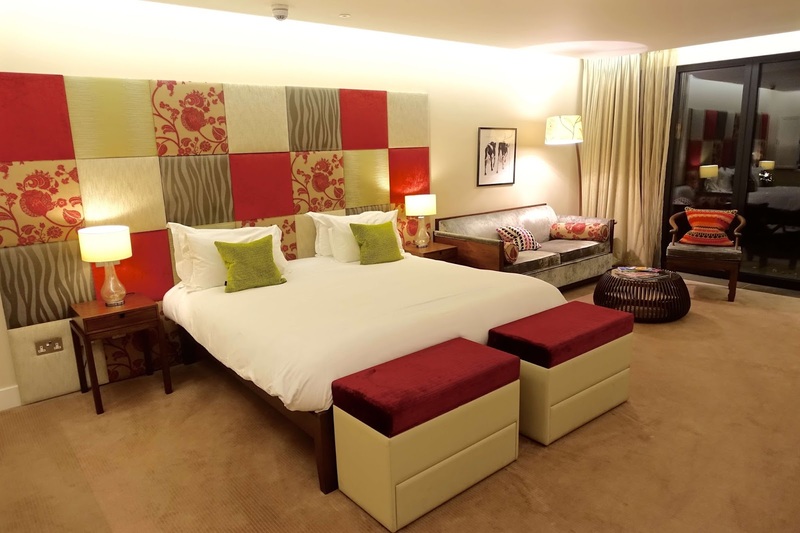 The spa has taken the liberty to provide luxury spa seekers with an optional extra during their stay - the option to stay in one of their luxurious spa suites for the night. 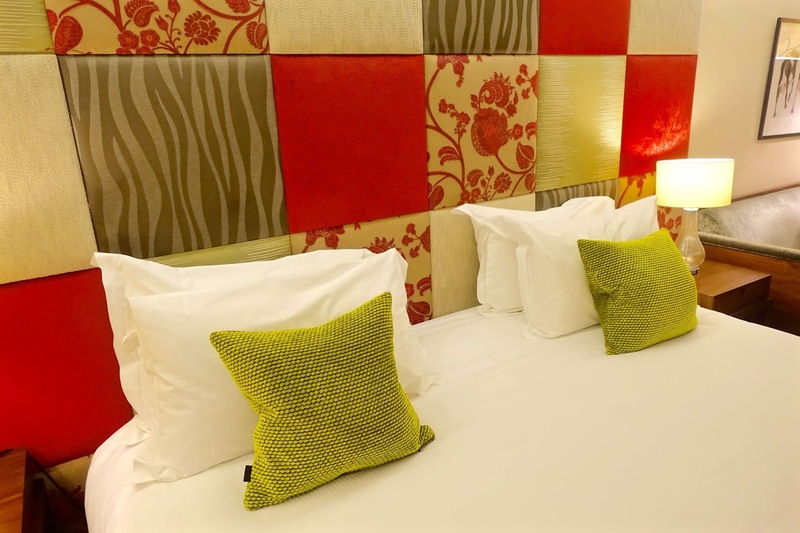 With six luxuriously spacious bedrooms complete with shutters in the bathroom that open out onto the bedrooms. 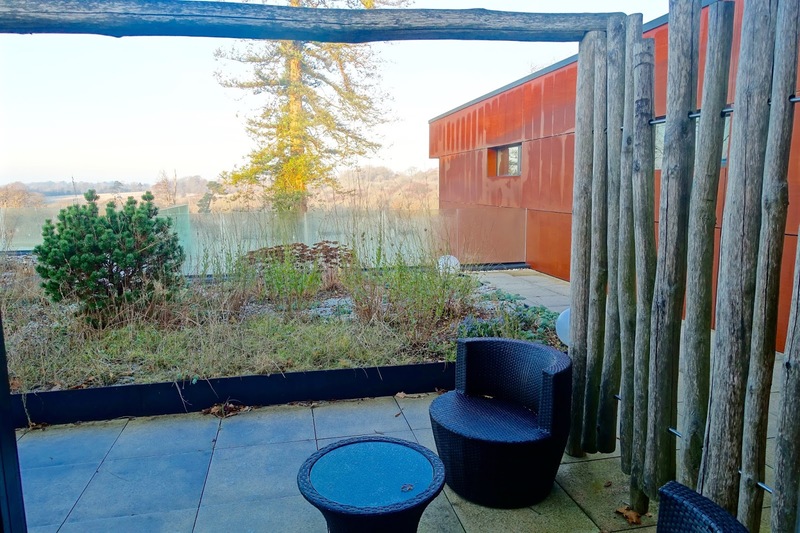 Each spa suite includes an enclosed roof garden with superb views. The spa suite was huge, with plenty of space for two. The bathroom, immediately on the left as you enter contains itself within a separate area complete with rainfall shower, separate enclosed toilet, large bathtub and his and her sinks. The bathroom shutters which open onto the bedroom are a lovely addition. The bedroom/living area housed a huge bed, sitting area, Nespresso machine, and outdoor sitting area. The decor was warm with red, green and gold tones and even though very spacious throughout, it still boasted that cosy feel. Wardrobes housed super fluffy dressing gowns and cosy spa slippers - the finishing touches for the ultimate hygge-escape! The six spa suites have direct access to the spa; with late opening hours, who wouldn't want an evening dip in the outdoor heated pool? Bliss! Dinner was again, a luxurious affair, guests have a choice of a fixed price menu or a foodie lovers seven-course tasting menu. 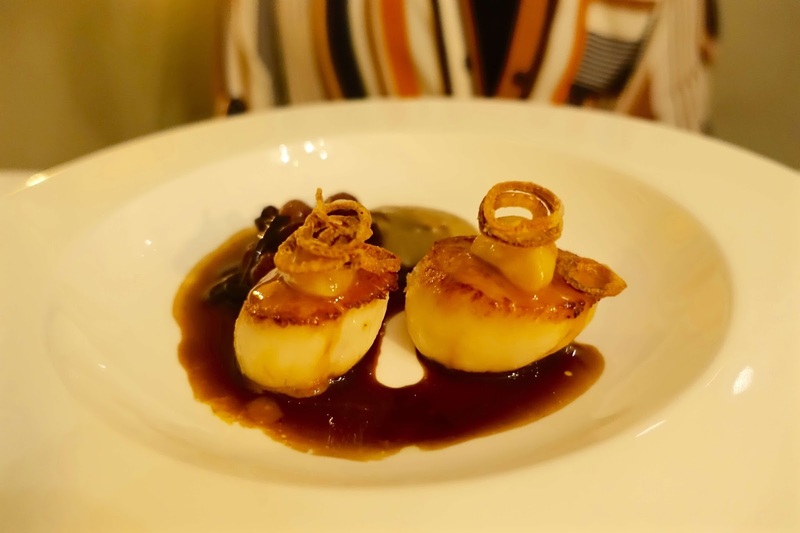 We chose the a la carte menu which will set you back £65 pp for 3 courses. 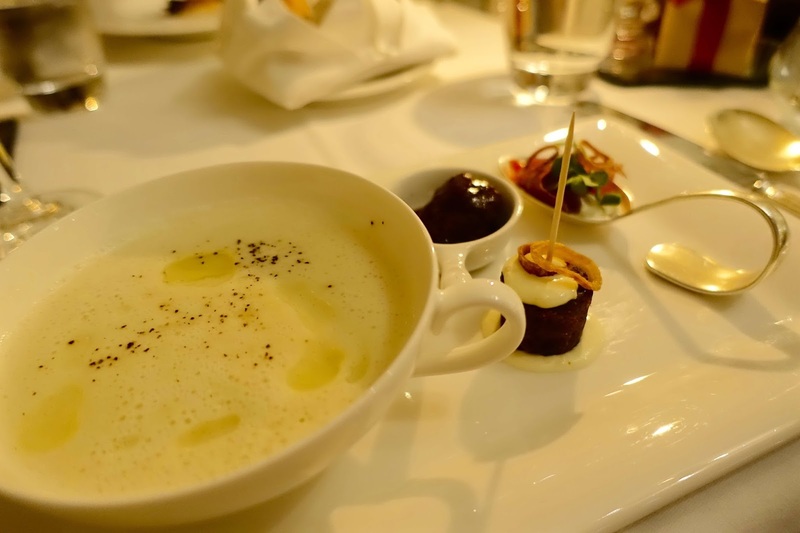 To start, I had the white onion soup; with a side of trenchmore farm beef bites. 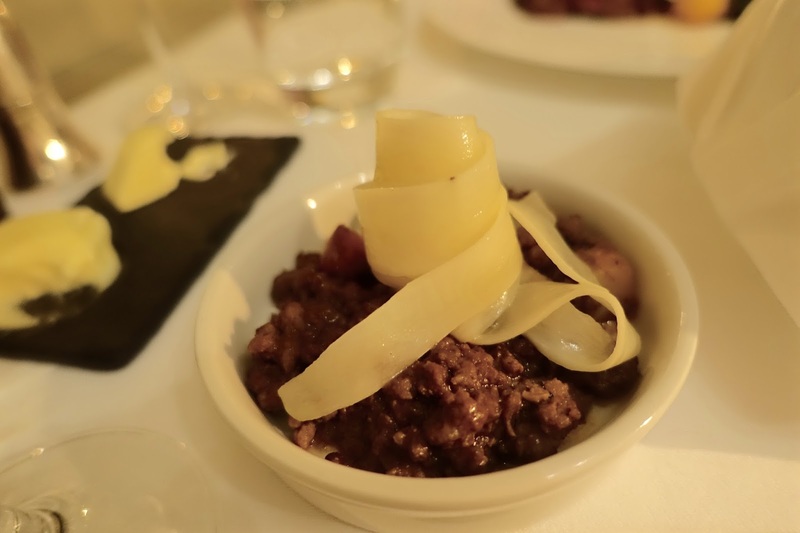 The soup was rich, sweet, but light in texture with warming flavours and the beef bites added a crunch and a further touch of french finesse! 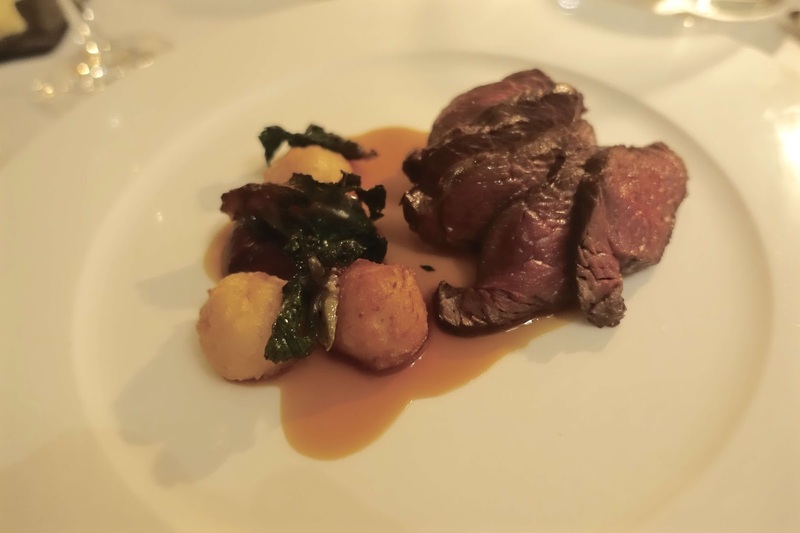 For mains, the Tournedos Rossini British beef fillet with truffled savoy cabbage and bacon and crispy potatoes was cooked to perfection and a small pot of rich and tender beef ragu with fresh pasta accompanied. 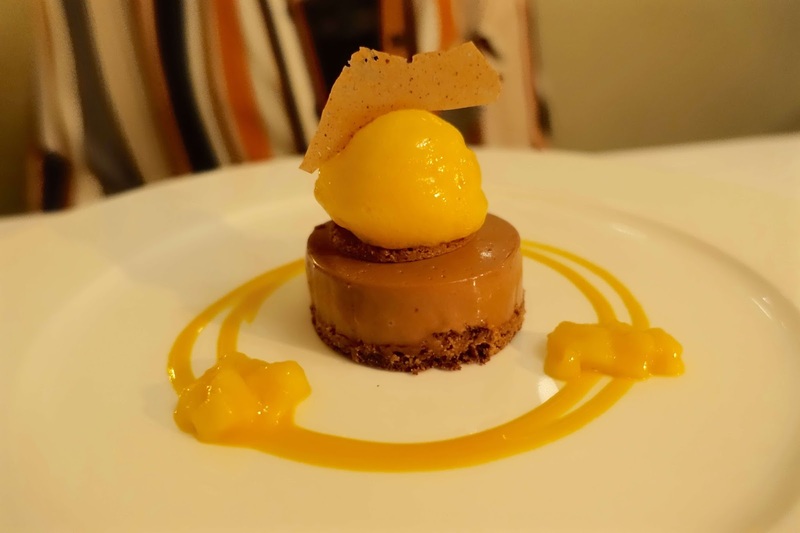 To finish; I had the caramelised lemon tart with blackcurrant sorbet. To be honest, this was far too sharp for my palette and believe me, I have a very sweet tooth! The lemon tart was super sharp and I was expecting the sorbet to complement with a balance of light, fruity flavours, however, the blackcurrant was just as sharp, if not more and every mouthful made my face wince! 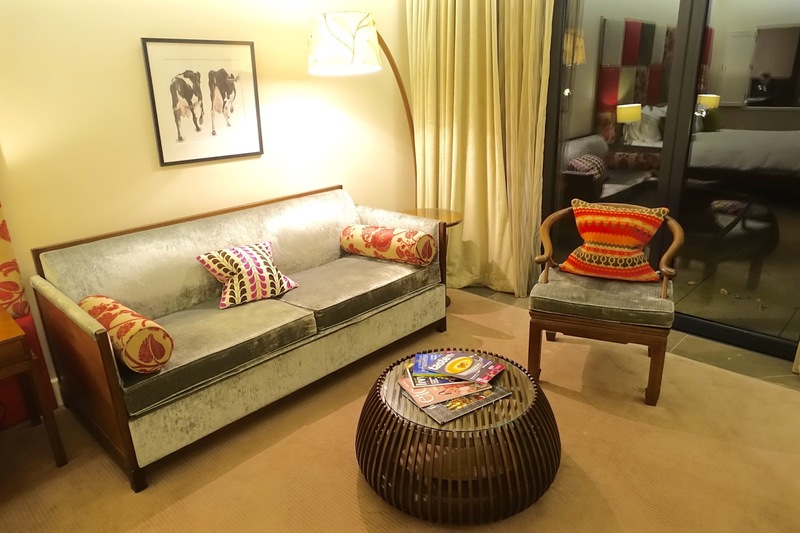 Overall we had a wonderful stay and although quite pricey, one day I would love to come back, and treat Alex to an overnight spa stay - the suites are divine!